The Carbon Claw PRO X ILD-7 fixing punch bag swivel is a practical accessory designed to enhance durability of your punching bags. 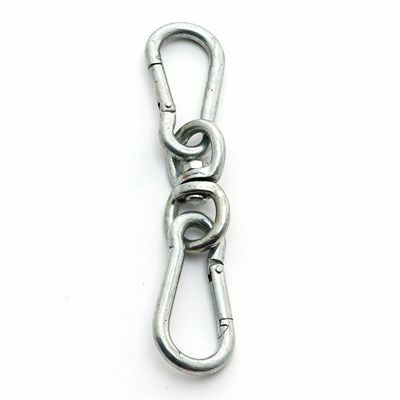 Made from cast steel, this heavy duty rotating swivel has a top and bottom snap lock fixing for quick and easy attachment of webbed strapped and chain hung punch bags. It offers a maximum weight capacity of 45kg (100lbs) and can be linked to a second or third unit enabling you to extend or adjust the hanging height of the bag. for submitting product information about Carbon Claw PRO X ILD-7 Fixing Punch Bag Swivel We aim to answer all questions within 2-3 days. for submitting product information about Carbon Claw PRO X ILD-7 Fixing Punch Bag Swivel. We aim to answer all questions within 2-3 days. If you provided your name and email address, we will email you as soon as the answer is published. for submitting product review about Carbon Claw PRO X ILD-7 Fixing Punch Bag Swivel.